Part Grand Theft Auto, part Champions Online, APB has the potential to be one of the coolest new MMOGs on the market. "We think of [All Points Bulletin] as being about the 'Three Cs,'" the game's Executive Producer Joshua Howard told me in a small secluded booth on the PAX East show floor, "Conflict, Customization and Celebrity." Notoriety is such a core concept to the game, he explained, that the developers at RealTime Worlds hoped that fame would be a fundamental driving force in getting players to advance. The level of customization in APB - a cops-and-robbers MMOG akin to what you'd get if you crossed Grand Theft Auto with a game like Champions Online - is really remarkable. I was able to play around with the character editor for a few minutes, and the amount of options that you could change on your character was frankly overwhelming. It was also a very organic and smooth experience, and it's notable how, no matter what I tried or how extreme I tried to set all the sliders, I always ended up with a character who looked human and not like some sort of monstrous freak of nature. But the true impact of the customization is how recognizable you'll become to your friends and foes, said Howard. You'll be able to design your own graffiti tags to leave your mark on billboards, and you'll even be able to taunt your foes - when I was gunned down in the middle of a firefight, I heard what were unmistakably the first few bars of "Axel's Theme" from Beverly Hills Cop, which my killer had created as his own custom "death tune" heard by his victims. 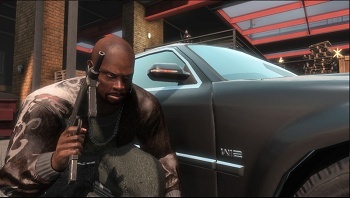 The gameplay of APB is fairly unique in an MMOG in how heavily it revolves around the conflict between Criminals (who prey and feed on the city's vulnerable innocents) and the law-keeping-if-not-always-abiding-by Enforcers (who prey and feed on the city's Criminals). I was given a short mission to travel to a nearby area and hold and defend it against Enforcer attack, but a rival Enforcer in my District (persistent zones of roughly 100 players) was given the APB that I was on the prowl, and was ordered to stop me. Though the Enforcer couldn't tell where I was, he knew where I was going, and was lying in wait. Being new to the game (but my opponent clearly was not), it wasn't long before I was swiftly gunned down... but to add insult to injury, the Enforcer had used a non-lethal weapon that only his side had access to, held me at gunpoint and handcuffed me. Arresting Criminals is harder, explained Howard, but you gain more respect as an Enforcer for not being just a bloodthirsty maniac. Still, the game controlled like your typical third-person shooter, and was very easy to pick up as someone who plays that kind of games. I held my own in the second (and final) shootout of my play session: I'd joined an open-world party, and we'd been given a mission to spread the graffiti tag of a particular gang all around the city to make their name known. There were four of us Criminals working together, and a group of four Enforcers got the APB to take us down. It was a very intense situation, guarding my teammates as they tagged, knowing that the enemy knew where our objectives were and could be lying in wait anywhere - but they didn't attack us until we arrived at the final area, a mall. After dying and respawning a short distance away (close enough to get you right back in the fight, far enough that you can't be camped) I finally made myself useful, covering my teammates as they worked to plant a bomb in the middle of the mall, guarding it until it exploded like a game of Counter-Strike. The mechanics of APB need more polish, as do the animations - it feels very clunky to move around - and it's particularly frustrating to drive, since the cars have a tendency to drift severely (this, Howard informed me, was a design choice to make the driving playable in up to 300ms lag). Still, the customization options are so cool - as is the idea that the top players will have statues of their uniquely customized avatars in the main social areas for the game - and the core concept of Enforcers vs. Criminals is so much fun, this will hopefully be a game to watch out for hitting later this year.